Be the first to share your favorite memory, photo or story of John . This memorial page is dedicated for family, friends and future generations to celebrate the life of their loved one. 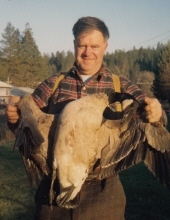 John Ray Williams, 79, of Coeur d’Alene, Idaho passed away on March 16, 2019 at Schneidmiller Hospice House in Coeur d’Alene. John was born in Spokane, Washington on December 8, 1939 to Ward J. and Nellie (Niederhood) Williams. John is survived by his wife of 52 years, Gayle Williams; three sons: Michael Williams, Corey Williams, and Darrin Williams; ten grandchildren: Bradley, Makayle, Steven, Marriana, Amanda, Remy, Jessie, Jarrad, Madilne and Amber; one great grandson, Neil; brother, Dennis Williams; and sister, Sharon Limesand. At the request of John there will be no services held. To send flowers or a remembrance gift to the family of John Ray Williams, please visit our Tribute Store. There will be no services held. "Email Address" would like to share the life celebration of John Ray Williams. Click on the "link" to go to share a favorite memory or leave a condolence message for the family.